White butterflies (Pierinae), a fairly diverse butterfly subfamily, count over two dozen species in a dozen genera within their ranks. 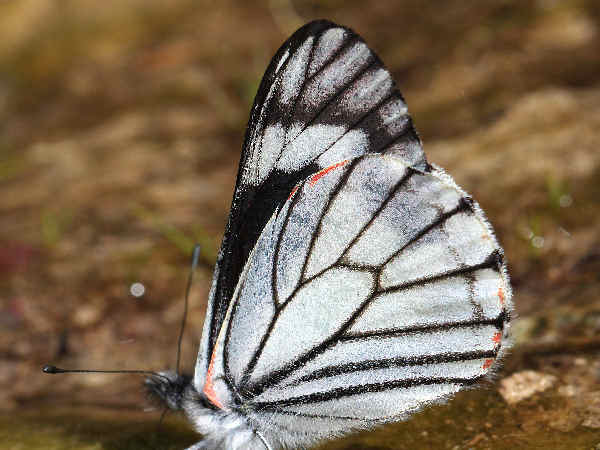 Despite the diversity, white butterfly identification is fairly easy because many of the species are regionally bound The small number of white butterfly species in any area are sufficiently different looking so as to make for the easy identification. Take as an example the Great Southern White (Ascia monuste), in the top picture. It’s a neotropical species with a native range limited to southern areas of the United States. The blue clubs at the and of the antennae serve as the best field identification clue for the species. From mustards to pines, white butterfly larvae display an eclectic palate. Pine Whites (Neophasia menapia), common Western species, fly wherever pine trees grow. The picture shows a top view of the wings. The curved border line on the top of the wing that starts at the body is a key identification mark. Chiricahua Whites are the other species in the genus. They are an Arizona specialty species. 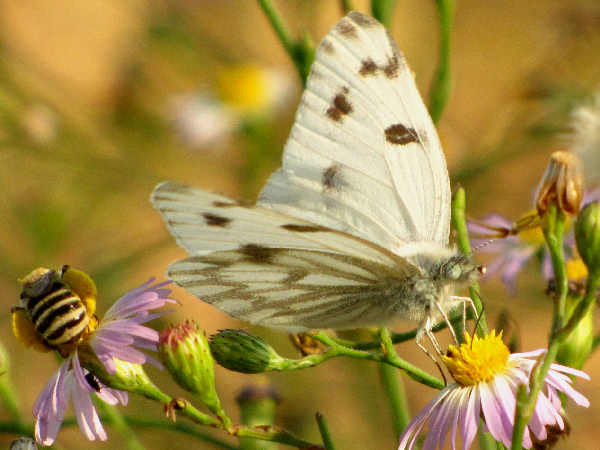 Four Pontia species, collectively called checkered whites also make a prominent showing across North America. 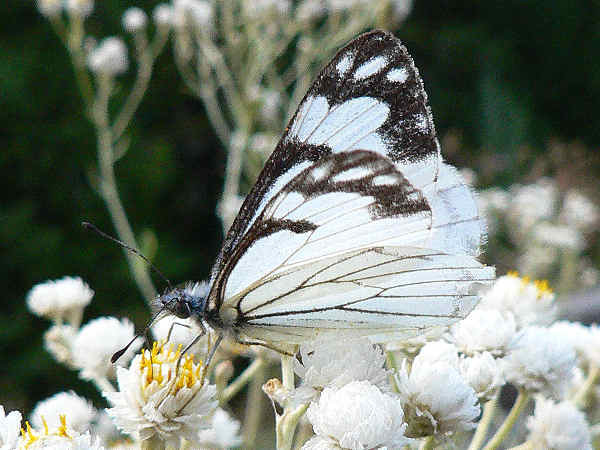 The Western White butterfly (Pontia occidentalis) extends its range through much of the Rocky Mountain region to western coastal areas. 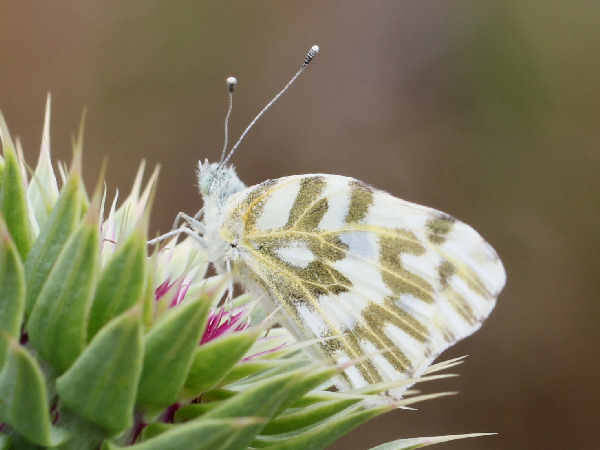 Becker’s White (Pontia beckerri) look practically indistinguishable. They are a common Western species. Apart from the Cabbage White butterfly, the Checkered-white butterfly is one of the most wide ranging of the white butterflies. The larvae feed on mustard plants, very common. 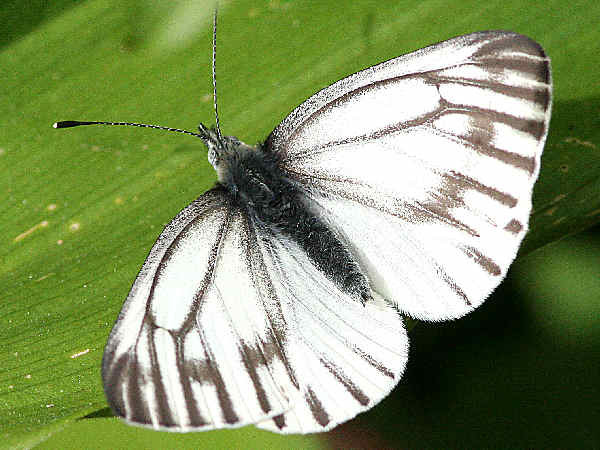 Giant White Butterflies (Ganyra josephina) wings can span close to four inches. They are a tropical species that can be seen in South Texas. 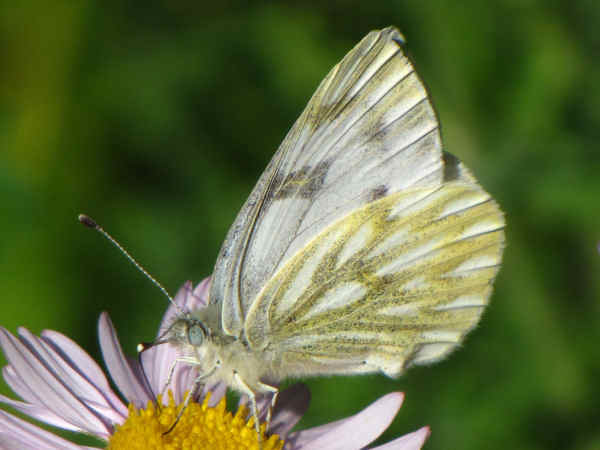 The Cabbage White Butterfly (Pieris rapae), one of the most recognizable whites, flies in and around residential gardens from spring through summer. Females, like the one in the top picture, have two black spots on an otherwise white wing. 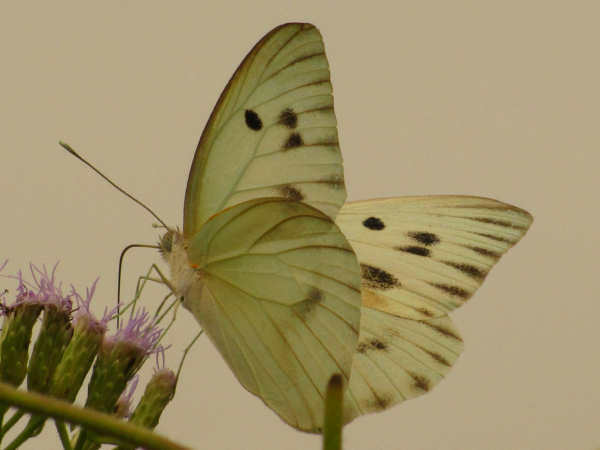 Males have one black spot on the wing. Their name derives from both color and diet. The caterpillars feed on plants in the mustard family (Brassicaceae). Cabbage, a mustard plant, naturally invites the species to gardens. Cabbage whites are introduced species, native to Europe. Their presence in any one area means they compete with other native Pieridae species that feed on mustard plants. 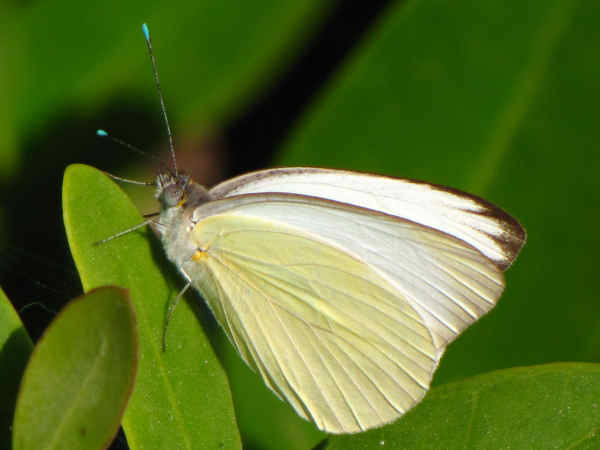 Margined White (Pieris marginalis) are a Western species. The darkened veins explain the name. 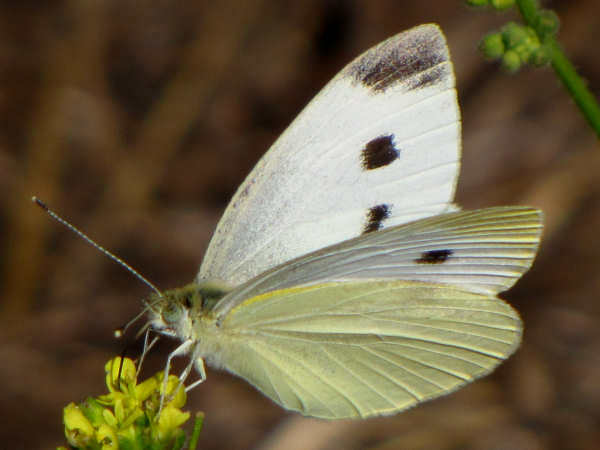 West Virginia Whites (Pieris virginiensis) are predominantly a species of the Applachian Mountains. There is some spillover into neighboring woodland areas. The top of the wings are very white. That’s a good field identificatton clue. 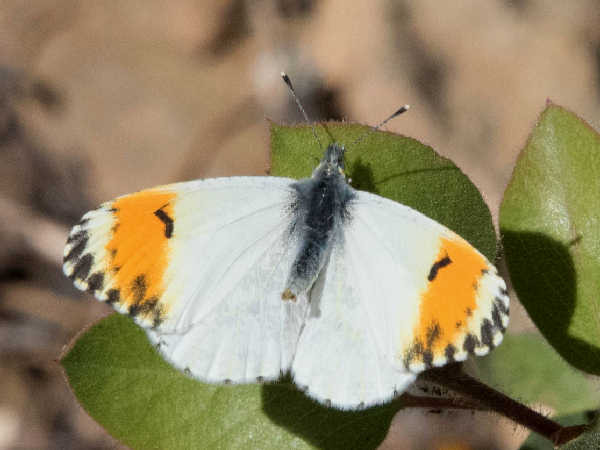 Seven different Orangetip species (Anthocharis) are regionally placed around the United States. The picture explains the common name. 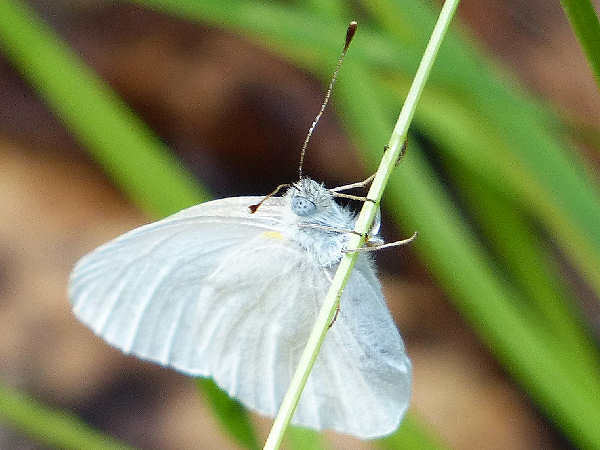 The top of the wings are white with an orange tip at the ends. They are small butterflies that fly in the spring. 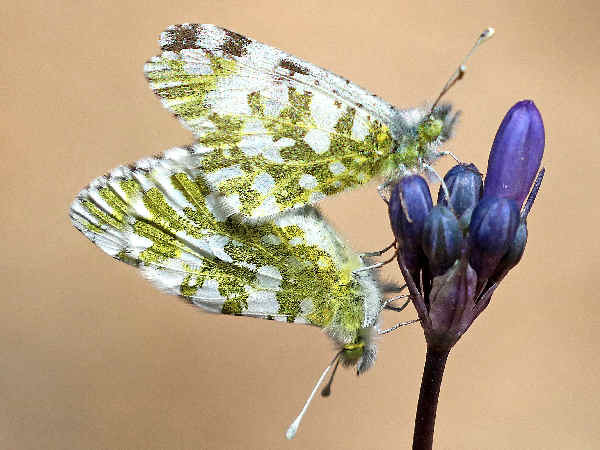 The picture shows the West Coast version, the Sara’s Orangetip. Seven species of Marble butterflies (genus Euchloe) are also regionally placed in the United States. The picture shows a California Marble.